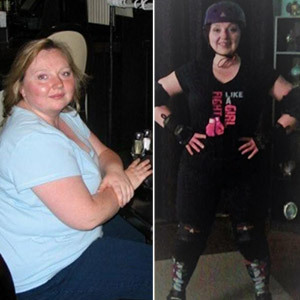 How the fun-loving Carla lost 100 pounds while recovering from an injury! I’m going to go back quite a while before joining Lean and Fit. About 10 years ago I was 273 pounds and I’d finally had enough. I drastically changed my diet and got active with the help of a personal trainer, and after about a year I managed to drop about 90 pounds. I continued trying to lose weight but could never seem to get past that 90 pound loss so I decided to be satisfied with the weight I had lost (I realize that’s still really heavy for a 5’4″ woman, but I was strong and I felt great) and get on with the business of living and enjoying my life, starting with a promise to myself that I would never gain that weight back. With that weight loss and the new energy I had, for the first time in my life I was not self conscious. I felt like I had a voice, I was no longer invisible, and I had value. I was able to start doing things I had loved as a child and had dearly missed (I’m a roller coaster junkie, but at 273 pounds, I was worried I wouldn’t fit in the seats). I started trying out new sports – roller derby, aikido, softball, dodgeball – I loved it all. As it turns out, I have a penchant for controlled violence; grappling is the best thing EVER! I kept my promise to myself, and for 8 years I kept the 90 pounds off and was still feeling fantastic until I injured my right knee in October of 2015. I thought I had just ‘kinda’ hurt it and that with time and a bit of rest it would feel better – not so much rest that I stopped playing or training though, and I ended up making it worse. Months of physio didn’t really help so my physiotherapist sent me to the Sports Med clinic at Mac where I was instructed to wear a brace 24/7 for about three months. After that period of time, I was told my knee was about as good as it was going to get, but that I could stop wearing the brace as long as I wasn’t playing a sport. During this time, my workouts became completely physio oriented, my knee still hurt, and my energy took a nosedive. And this is where the pity party began. I signed up for the six week challenge in October 2016; my first weigh in was October 24 and my first workout was with my trainer, Corey, later that week. I’d heard how ‘tough’ the Lean and Fit workouts were so I wanted to get a head start! Well, I had made myself that promise to never regain my weight, and then along came a nice, stable relationship where I gained a little weight. Nothing major, maybe 5-10 pounds. Then came the knee injury… since my workouts were negatively impacted by the injury I gained a little more weight. Then came the pity party… I wasn’t able to workout ‘properly’ and stopped caring about my nutrition. On top of the 5-10 pounds of ‘stable relationship’ weight, came another 20-25 pounds of pity party weight. I felt like I was on a slippery slope back to where I started and I decided I needed to take action and keep my promise to myself. And if that’s not enough, I also wanted to be the best person I can be for the sake of the people I love. My partner and I enjoy an active life, and if I gained back all of that weight, there was no way I’d be able to keep up with the life we’ve created. I also have a 3 year old niece that I love with all my heart! I want to be, and I am, the super fun auntie who took her on her first roller coaster, who clears the furniture from the living room so we can practice somersaults, and who climbs and plays on the playground equipment with her. I wouldn’t want it any other way! The problem with all of that is I need to be pushed. I know how to exercise, I know to balance pushing with pulling, to start with the major muscle groups, to get my cardio, to do my mobility exercises – all that good stuff! What I don’t know, is how to push myself. I needed to find a solution where a trainer is present and is pushing me – not just at the front of the room showing me the exercises, but paying attention when I’m being lazy. I also needed to fix my nutrition, so having the instructors present during my workouts in addition to someone checking up on my nutrition was a double win! Some might say it’s childish to need to be ‘checked up on’, but it is what it is and I consider recognizing that and doing something about it a win. I realize I could have been focusing on my nutrition and modifying my workouts when my knee was hurt, but I didn’t… and woulda coulda shoulda wasn’t getting me anywhere so I decided to take action with Lean&Fit! I didn’t necessarily have any health conditions before starting (aside from the knee injury), but my blood fats have always been on the high side. I recently had a full work up done and was told by my healthcare provider that my results came back showing optimum health for a 30 year old. Not bad for someone who’s pushing 45! Everything can be taken from man but one thing; the last of the human freedoms -- to choose one's attitude in any given set of circumstances, to choose one's own way. My friends and family are, for the most part, extremely supportive! They see how much happier I am and they’re happy for me. Some are intrigued and want to come work out with me, and my partner, Neil, has joined Lean and Fit. There are a couple of folks who have implied I must be starving myself to be losing weight, but I’ve assured them I’m not. I decided for a period of time that I would track my calories using an app, and it turns out I’m eating approximately 1500 calories on rest/light training days and approximately 1800 calories on heavier training days. Compared to the 1200 calories many other ‘diets’ recommend, I’d say I’m eating plenty – and still losing weight! 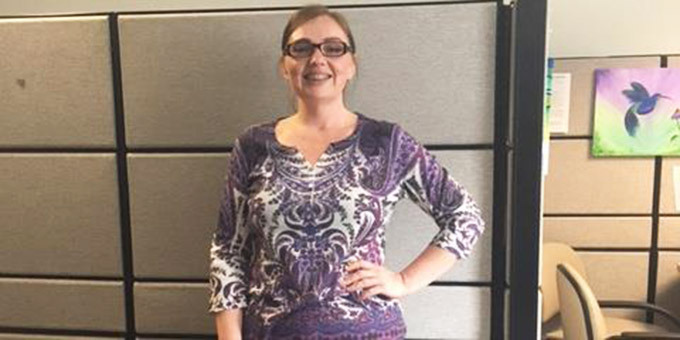 I have met so many wonderful people here – and it’s always so nice when someone I hadn’t realized was paying attention to me makes a point of telling me how great I’m looking or asks how much weight I’ve lost because they’ve seen such a drastic difference. I tend to come at the same times each week so I get to see my ‘regulars’ in my group and I absolutely love it. We laugh at and with each other and we push and motivate each other – sometimes we will ‘compete’ to see who can hold the longest v-sit or who can outsprint the other – it all adds to the ‘fun’ aspect. Now that I’ve been there for a bit, I also look forward to chatting up new members and making a point of telling them when they’re doing something really well. It’s a win, win. All of them… each and every one… From my first Lean and Fit workout where Kristine regularly checked on me, to Eden who was the first person I met on the first official day of my challenge and who often strength trains at the same time as I do and mercilessly harasses my trainer (in a super fun way! ), to my trainer Corey S, who is incredibly knowledgeable and who pushes me to keep going long after I’d have thought I’d done my last rep. John and Mia are both super friendly and supportive, know their clients by name, and regularly check in to see how I’m doing and to make sure I’m still enjoying the program. If I’m honest, the staff and the people are what sold me on this program – the results were important, but if I didn’t enjoy the company I was keeping, I’d probably have a tough time convincing myself to keep coming back. I’ve never been greeted by anything but smiles, support, and encouragement and I can’t thank the staff enough! So, to any staff member who is reading this, thank you!! As far as Lean and Fit goes, my goal is to get through one group workout without missing a single rep – I’ve come close a couple times, but still have some work to do. Outside of Lean and Fit, I’m dying to get back to my mud runs – they are SO much fun! The first year of Hell in the Harbour (Hamilton’s mud run) I was in the top ten for fundraising and I’d like to get to first place – all the proceeds go to the Special Olympics.